Apple remained the fourth largest smartphone vendor in China in 2016, beaten out by Oppo, Huawei, and Vivo in first, second, and third places, respectively, according to new data from research firm IDC. As a whole, IDC said it was a good year for the smartphone market in China, which saw a 19 percent year-over-year growth in 2016, and a 17 percent quarter-over-quarter growth in the fourth quarter of the year. Unfortunately for Apple, 2016 also represented its first ever year-over-year decline in the Chinese smartphone market. IDC noted that the new iPhone 7 debut "did not create as much of a frenzy compared to the past" launch of other iPhone models, but the firm doesn't think that vendors like Oppo, Huawi, and Vivo are stealing Apple's market share away. IDC believes that most of Apple's loyal Chinese users simply took an off year in 2016 in anticipation of 2017's "iPhone 8." 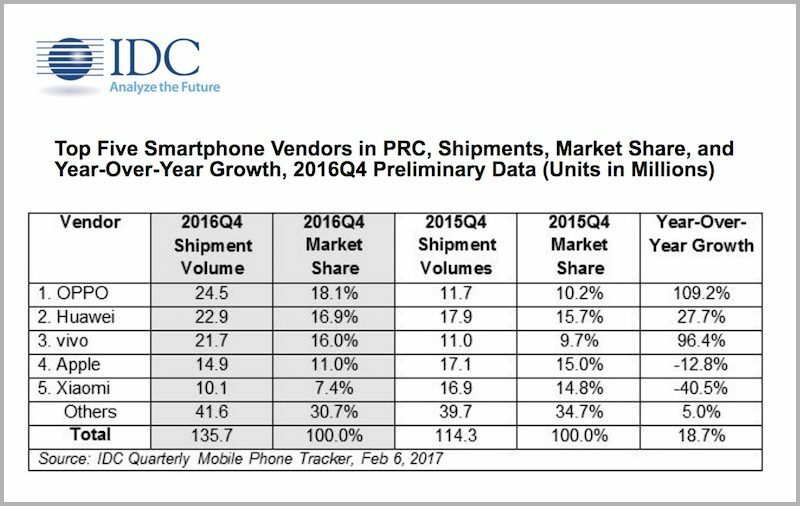 2016 was the first time ever that Apple saw a YoY decline in the PRC market. Even though the new black colored iPhones caught the attention of consumers, overall, the new launches did not create as much of a frenzy compared to the past. 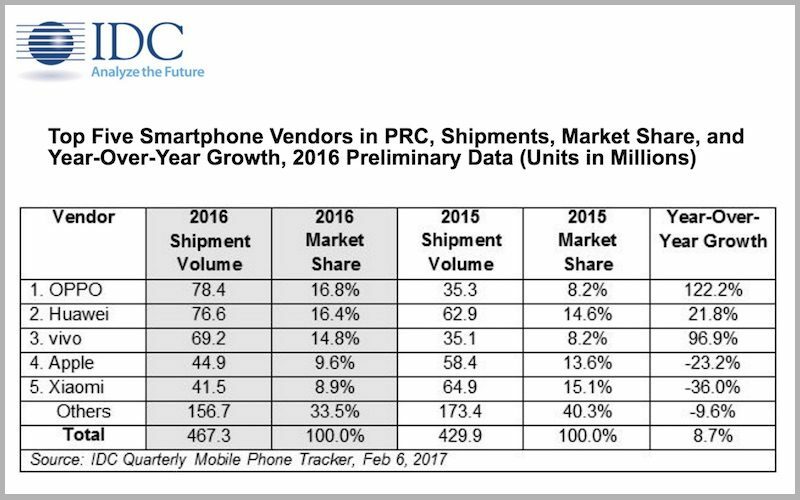 Despite the decline, IDC does not believe Chinese vendors have actually eaten away Apple's market share. Most Apple users are expected to be holding out for the new iPhone that will be launched this year, and that will help the brand to see a growth in 2017. Apple's 10-year anniversary iPhone will also likely attract some of the high-end Android users in China to convert to an iPhone. The overall growth in the smartphone market in China is said to be fueled by an "increased dependence on mobile apps" that led to consumers seeking device upgrades. Even in lower tiered cities, users sought out upgrades, which Apple's iPhone was too high-priced to justify. Instead, Oppo and Vivo "aggressively pushed mid-range smartphones in these cities," according to Tay X iaohan, IDC senior market analyst. The last note in the research firm's report focused on the slowdown of online shopping in 2016, with companies shifting to bolster their brick-and-mortar retail presence in China. This includes Xiaomi -- ranking as the fifth largest smartphone vendor -- which opened new Mi Home stores throughout the year to drive retail growth. "Apple has also been aggressive in increasing its offline retail presence," according to IDC. Just last month Apple launched its seventh retail location within Shanghai, China. One of Apple's biggest achievements in China is the App Store. In the third quarter of 2016, the country became the number one largest market in the world for App Store revenue on iOS devices, according to App Annie. Otherwise, Apple has been slowly losing market share in China for a while, with Europe last summer regaining its position as Apple's second biggest market after the United States and ahead of China. In other news, more people buy McDonalds burgers than buy steak dinners. That doesn't mean they can't coexist. I never understood how a phone that is expensive to most of us in the west is affordable in countries like China or India. Considering what the annual wage is in India how can an iPhone of any description be affordable? China has roughly 1.400.000.000 people. If 5% has decent wages, this means 70.000.000 potential customers. Get it? For all those about to make sweeping generalizations of ~half the world's population, remember that a small-percentage middle-class-and-above is still millions and millions of people who can easily afford an iPhone, just like you and I. And even if that 5% doesn't at first blush seem to make that much each year, the cost of living is much lower. You can make $100,000 a year in China and that means you can have a full-time maid/cook. When food and other daily expenses are really cheap, you can splurge on stuff like an iPhone if you want. China and India equally, are countries where social status is highly regarded, much more so than in the West, and people will literally cut down on everything else to afford luxury goods and be able to announce to the world that they are 'of means'. You see it here too, but to a lesser extent. Also, China is no longer the rural, peasant society it once was. The industrial and manufacturing revolution that has occurred there has produced a surging middle class that now has disposable income beyond life's necessities.